Today, I've been working on a darling, little rush seat chair. I picked up three closely matched ones at an auction some time ago. Two of them had replacement seats and all three were painted a startling shade of yellow. 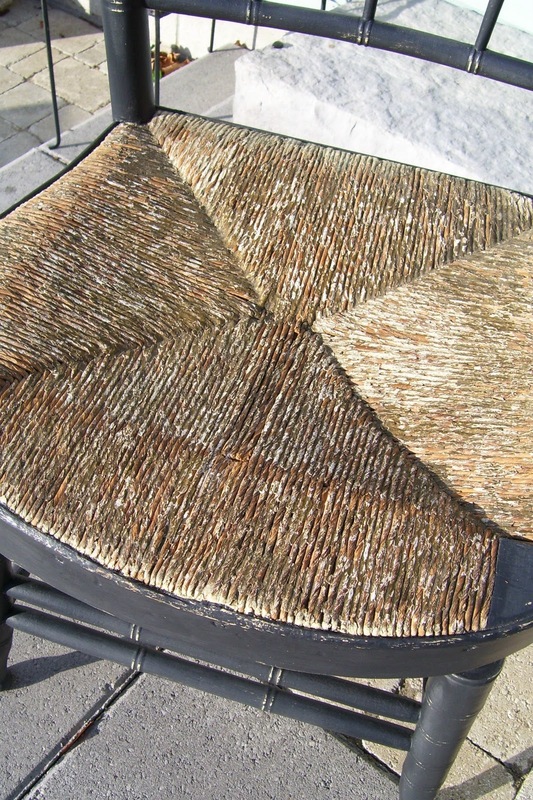 Although the use of rush (bulrushes or cattails) dates back to antiquity, these chairs appear to be from the mid to late 1800's. Around that time, the great designer William Morris re popularised rush seating as beautiful in it's simplicity and craftsmanship. I love to think of the history of the furniture pieces I handle. 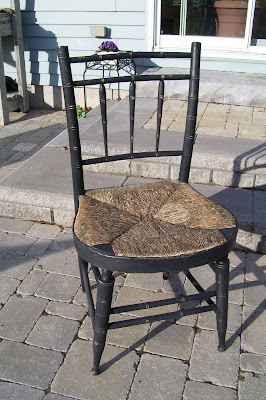 These chairs were being crafted at the time Toronto was being incorporated into a city, Andrew Jackson was president, Charles Darwin was setting out on his voyage, slavery was being abolished in England and William IV was King. It's also the year sandpaper was patented and I use a lot of sandpaper! 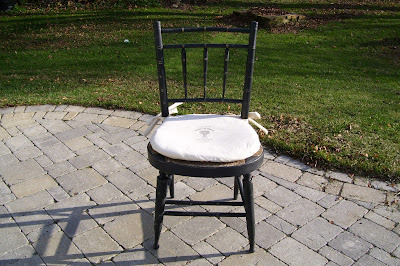 There are no before pics as I sold the first two chairs pre blogging. All three chairs received a coat of black paint which would have been the most usual colour for them originally. They also had rings of gold painted on the backs as was usual at that time. The last chair retained the original rush seat and it was in reasonable condition. A few pieces of rush had broken on the top layer and I glued those down with No More Nails. I consider that stuff a wonder product! A little scuffing with sandpaper (Aren't I glad it was invented or I'd be scraping paint off with my finger nails!) and a coat of clear wax and the chair is renewed. I wanted to add a simple cushion and took apart an old one to use the stuffing and as a pattern. A left over piece of drapery lining fabric looked like the simple muslin from that era. 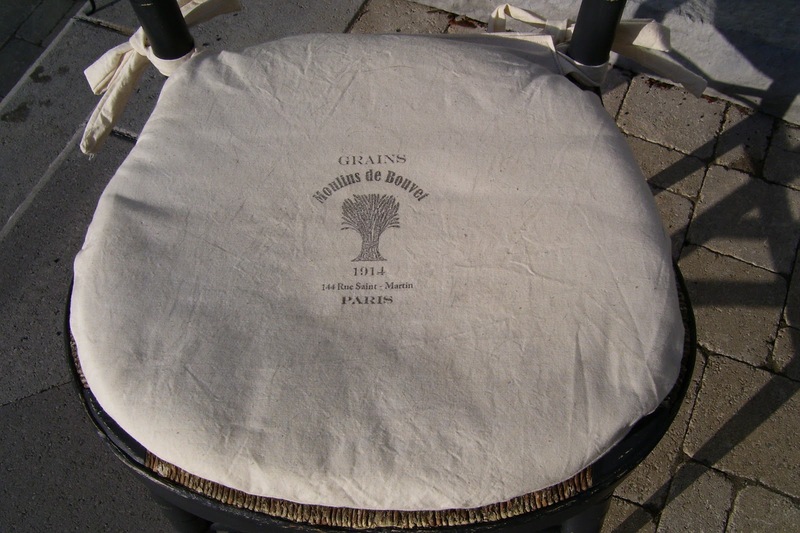 I downloaded a wheat sheaf graphic from The Graphics Fairy and used the Citrasolv transfer method. (You can see the tutorial on my Citrasolv DIY post). I think this little chair feels right at home in her new/old makeover! Best of all, the first two chairs paid for the third. Since everything else was on hand, the cost was zero!!! Imagine having a warm enough day in November, here in the frozen north, to do this outside!!! 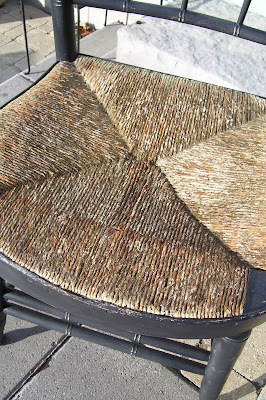 I love the pattern of the weave on the seat and your cushion turned out lovely! 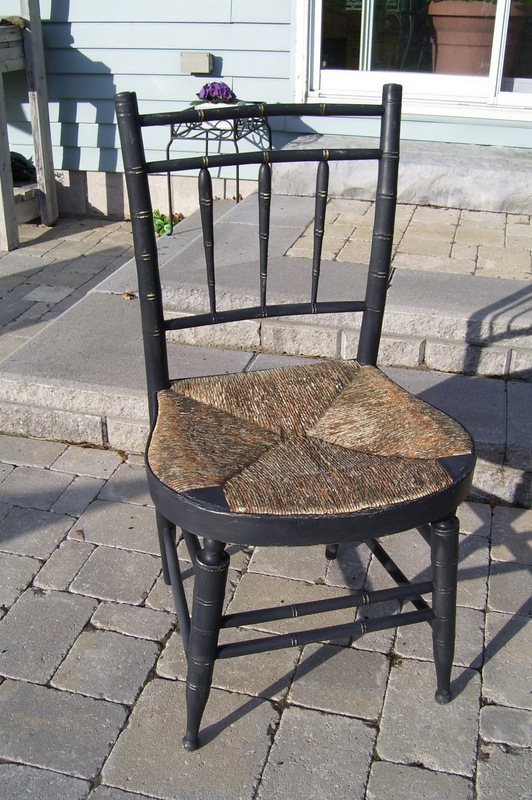 It`s a beautiful chair and great history lesson to go with it! Thanks for stopping by my blog and the lovely compliment. Love to see your sign finished.